Chicken breast, mature cheddar cheese with smoke flavoured sweetcure bacon and seasoned mayonnaise topped with tomato and lettuce on malted bread. Overall, this sandwich delivered on its promise. All the ingredients were there, and noticeable - the bacon was nicely flavoured, the cheese actually had some tang and bite to it, and the chicken was nicely tender. The only issue I have with this sandwich is the fact that it's a "Club" sandwich - that is to say, a sandwich with three slices of bread in each half. While I don't object to large amounts of bread on principle, I find that the middle slice of bread (which has filling on either side of it) can often end up getting quite soggy. I don't really understand what the extra slice of bread adds to the sandwich (apart from an increase in carbohydrates, and an increase in width) so I can't see why the sandwich makers don't just put these same filling ingredients in between two slices of bread, as per a normal sandwich - what would you lose, by removing the middle slice of bread? It doesn't seem, to me, to be an integral part of the sandwich. Having said that, I knew it was a Club sandwich when I bought it (the packaging proclaims as much) and I enjoyed it nevertheless. I would buy this sandwich again. TV idea: Ready, Steady, Book! "Ready, Steady, Book!" is a literary programme, based on the "Ready, Steady, Cook!" format. Two members of the public choose various words, phrases, and punctuation, and then two celebrity authors have to write a novel or short story with whatever raw materials their teammates provide. A studio audience then listens to a reading of both books, and votes on which one they think should be the winner. While bigger screens, slimmer bodies, voice-recognition technology, etc. is all very well, I believe that none of that stuff is as important as that biggest of all mobile phone issues: the stupid noise made by HiFi speakers, radios, PA Systems or other audio equipment whenever a mobile phone is nearby. "I don't know?! It's not me; I'm not vibrating. Are you vibrating?" I believe that the entire research and development budget of all the mobile phone companies in all the world needs to be put into stopping this irritation once and for all - once that is fixed, then (and only then!) can you go back to creating all kinds of whacky apps, top-quality graphics and social networking integration. Chocolate digestives. Everybody loves them. As you can see, there is nowhere really to hold the biscuit, without touching the chocolate - when it will inevitably melt on your hands, leaving a sticky, chocolatey mess. My proposed design adds two chocolate-free "handles" - one area on either side of the biscuit which allows the biscuit eater to hold the biscuit without getting chocolate on his or her hands. 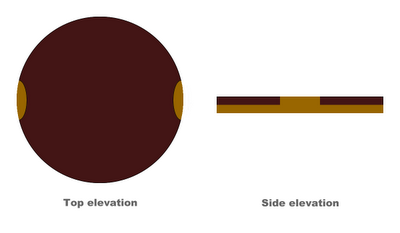 To compensate for this loss of chocolate, the chocolate covering the rest of the biscuit is a thicker coating. I hope that all biscuit manufacturers will shortly put this new innovation into place, so that everyone can enjoy delicious chocolate digestives without getting melted chocolate all over their hands. #F1 - Woe Man Grosjean?! I believe Romain Grosjean's one-race suspension (effective for this weekend's Italian Grand Prix in Monza) to be most unfortunate. I'm not saying it's unfair, or undeserved - but it certainly is unfortunate. It has, however, been difficult to keep the faith, over the past fews days, in the midst of the backlash from last weekend's first-corner carnage at Spa Francorchamps, in Belgium. The crash which took out Championship contenders Lewis Hamilton and Fernando Alonso, as well as Sauber's Sergio Pérez was initially triggered by Grosjean off the start line, and this is the reason for his unfortunate one-race ban. To be absoutely clear, I am certainly not condoning Grosjean's driving off the line in Belgium; having watched numerous replays, it was definitely a very poor piece of driving, and the resulting incident was frighteningly close to being very serious indeed (in terms of injuries, or even fatalities). The punishment for this error of judgement is severe, but not unfair. My worry, though, is that it unfairly tarnishes other race fans' opinions of Grosjean - a young, talented racing driver, with lots to give. Something which has particularly alerted me to this possibility is the statistic being constantly parroted in news articles, and on forums and message-boards across the web, that Grosjean has been involved in no fewer than seven incidents in the opening stages of a Grand Prix - six times on the first lap, and once on the second lap. Whilst factually accurate, it is my opinion that this statistic doesn't portray Grosjean in a fair light. After all, how many of those incidents were actually his fault - and on how many occasions was he just unlucky? I have been looking into this, and with the help of this handy video from BBC sport, showing all of Grosjean's opening-lap crashes this year, I shall attempt to point my point-of-view across. "The pass was done, and Grosjean should've got out of the power there!" But having watched this crash several times, I can't honestly say I agree with that analysis. As they come 'round the bend, it looks to me like Maldonado squeezes Grosjean, and he runs out of room on the track. I don't have the experience or the insight of Coulthard, of course, but I can't reconcile myself with the idea that this crash is solely Romain Grosjean's fault. At the apex of the turn, the two cars are level with each other - Maldonado has more pace, but he has to allow Grosjean the space he needs on the exit of the corner, and he doesn't do that. In my opinion, this is purely a "racing incident" - just one of those things that happens. This first lap collision with Michael Schumacher is a difficult one to call. So much rain is there spattered on the lenses of the cameras that it's hard always to see what's going on in these replays. Relying as much on the commentary as anything else, it seems that Grosjean touched Schumacher's car from behind - which, in the wet conditions, was enough to send the German driver into a spin. In my (inexpert) opinion, it appears to be another "racing incident" - although I would say that Grosjean is more at fault than Schumacher, on this one, being the car behind. Racing in wet weather is tough, though, and things happen so quickly that one tiny mistake can have big consequences. In the end, Grosjean later retired from the race, and Schumacher recovered to finish 10th. Another hard one to judge, this. Contact with Sergio Pérez at the third corner on the first lap causes a puncture on Pérez's car, forcing him to pit for tyres. The only camera angles I have found of this have been most unhelpful, and it is hard to see really what is going on - again, Grosjean closest to the edge of the race track here, and it's possible to accuse Pérez of not allowing him enough room, although this would be quite a flimsy claim. The most concrete thing anyone can say about this incident is that there was no penalty award to either driver in its aftermath. If the Race Stewards (with many more camera angles than I will probably ever have access to!) didn't deem anyone to be at fault for this, then, in the absence of any firm evidence of to call my own, I can hardly go against that! Yet another "racing incident" (at least in the eyes of the Stewards!) it would seem. Grosjean's contact with Michael Schumacher off the line in Monaco was a particularly unfortunate one, I thought. It added to a catalogue of woes for the Schumacher - the seven-times World Champion had been the fastest car in Qualifying, but had been demoted for a pervious incident with Bruno Senna in Spain. I really felt for Michael in this situation, as he hasn't had the best of luck since his return to the sport, and his Qualifying performance in Monaco allowed us all a glimpse of what he is truly capable of, and showed us that he can still be the great racing driver that he undoubtedly was during his first career in F1. This first-lap crash was a sad end to what had once been a very promising weekend for the German. Having watched the replays, this is a fairly cut-and-dried one, and I have to concede that it is Grosjean's fault. He was ahead of Schumacher on the grid, but the Mercedes is faster, pulling up alongside Grosjean's Lotus as they move away. Grosjean is guilty here of not being quite aware enough of his surroundings, in my opinion - he doesn't seem really to know that Schumacher is there next to him, and he cuts across the Mercedes as they leave the grid, without allowing him enough space - they touch, and Grosjean's car spins 'round, ending his race. "Unfortunately, I think that's just one of those things, in Monte Carlo." Another heartache incident here, as the victim is promising young British driver Paul Di Resta who collects a puncture and ends up retiring from his home Grand Prix at Silverstone (interestingly, Di Resta's only non-finish so far this year). Despite his impressive record, though (only one DNF this season), I am inclined to blame Paul for his puncture at the British Grand Prix. Di Resta's Force India car comes across the front of Grosjean's Lotus, as they exit the corner, and his rear wheel tags Grosjean's front wing, causing the puncture. From watching the replays, there is nothing (so far as I can see, anyway!) which suggests that Grosjean in any way altered his course into the path of Paul Di Resta's car, and I can only assume that this was an error on the part of the British driver, thinking he was already well clear of Grosjean, when, in fact, they were still slightly overlapped. Another really tough one to decide, here - not least because the footage of the actual incident itself is so scarce. It looks, from what I can see, as if Grosjean is hit from behind by Felipe Massa, but it is difficult to apportion blame to either driver, on such scant evidence. Like in Spain, the only thing I can say for definite is that there were no penalties handed out by the Stewards for what happened - in their eyes, I assume, this was another "racing incident", and from the little of it I've seen, that is an explanation which satisfies me. So much has been written about this already, it seems a little pointless for me to delve into it too deeply now. Yes, of course this crash was Grosjean's fault - it was stupid and reckless, and it could've ended up seriously hurting someone. So, in conclusion, only two of those incidents (Belgium and Monaco) were definitely Grosjean's fault. The other five are debatable, at best. The one-race ban, as I've already said, is a harsh but fair punishment for the crash in Spa. I am pleased to see that Grosjean's response to his suspension from racing has been a mature and responsible one, apologising unreservedly for his actions, and vowing to be more aware from now on. What saddens me, though, is articles painting Grosjean as a perpetually reckless or dangerous driver (like this one in the Globe and Mail) or comments and Blogs which lump Grosjean in with Pastor Maldonado - a man who, in my opinion, is a very dangerous driver, with a history of overly-aggressive driving, and using his car as a weapon (see the comments at the bottom of this article on ESPN for examples of what I mean). I hope that, when the dust settles from all of this, and Grosjean returns to F1 in Singapore at the end of September, the world of racing fans can see through this unfortunate episode, and continue to recognise the talent and potential which this exciting young driver brings to the sport. 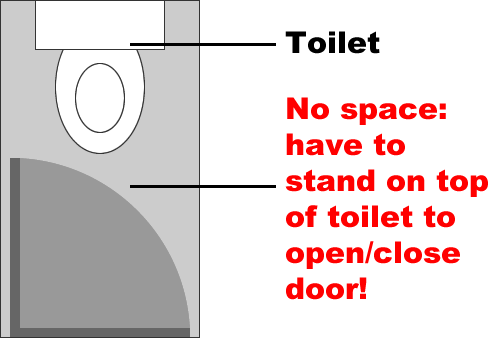 I know space-saving is key, as one of the most oft-heard complaints about public venues (whether for entertainments, arts, sports, education, or anything else) is that there are insufficient toilet facilities available, and cramming more and more (ever-smaller) cubicles into the allotted space seems to address this. 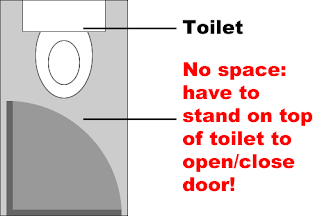 However, please - and this is very important - please ensure that there is sufficient space to open and close the toilet cubicle door once inside. 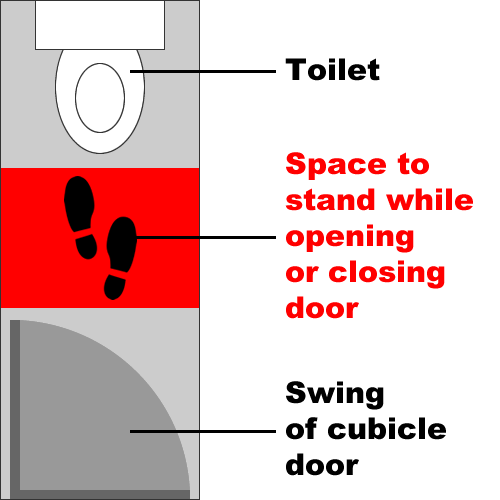 Do you see how there is plenty of space between the toilet bowl and the swing of the door, where a person can comfortably stand as they open and close the door? Where can one stand, when opening or closing the door? The only option is to stand on the toilet. Ridiculous! 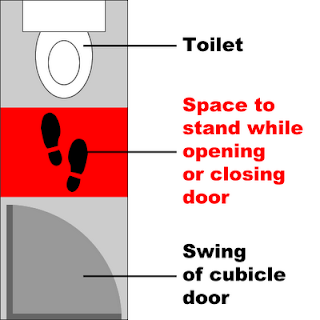 So please, save space where you can - but do remember that this little strip of standing space is an essential component of toilet cubicle design, not a luxury. When the London 2012 Olympics ended a few weeks ago, I wrote a Blog post about my Olympics regrets. I regretted not having been able to be a part of such a momentous event. I'm delighted to say that I am both pleased and proud to have been a part of the Paralympics - an event which I have no doubt will be remembered as an inordinate triumph. Yesterday, I spent a whole day at the London 2012 Paralympics, with my dad, and my sister. We had day-passes to the ExCel centre, and we saw a variety of events throughout the day. We watched the Wheelchair Fencing, we marvelled at the extraordinary Power Lifting finals, we cheered Team GB in the Sitting Volleyball (even though they got badly beaten by Brazil!) and we learned how to pronounce "Boccia". The thing which struck me the most about the Paralympics was just how wonderful the atmosphere was at all the events we saw. Talking about it on the way home, Dad and I both agreed that the whole thing had felt like a big party - a party where you didn't really know anyone, but where you didn't need to, because everybody was so friendly and warm-hearted, you just instantly got along. The organisers have done a great job of the event - everything is clearly signposted, there's ample space for queueing/eating/resting/whatever and the GamesMakers are helpful, friendly courteous, enthusiastic, and knowledgeable, and are always smiling! The in-house presenters and commentators do a great job of setting the mood, and getting the audiences involved, and the result is that the crowds really get behind the athletes. Obviously, there was huge support for the British athletes, as the home team - hearing an entire ExCel Arena shouting itself hoarse for the Team GB's Sitting Volleyball Women's Team was quite an experience, and I shall never forget how the place erupted as one when the big screens (which are dotted all around the venue) showed a clip of British Paralympic Swimmer Ellie Simmonds from the Aquatic Centre. But even at the Power Lifting, where there were no British competitors in the events we saw, the crowd really got into it all, and you could feel that whole room of people willing on each athlete to achieve the best he or she possibly could. The only bad thing about my Paralympic experience (and I do mean only) was the rapid resurfacing of my disappointment not to have made it through the final stage of the GamesMaker applications. As I've already mentioned, all the GamesMaker volunteers really are fantastic at what they do - I have so much respect for them. Other than that, however, the whole day was brilliant. The Paralympics is an amazing event, and to be a part of that felt just as amazing - if you haven't got involved yet, I would absolutely urge you to do that when you can, before the opportunities to see it all are gone for good! #F1: good unpredictable, or bad unpredictable? I remain unconvinced by this idea that Formula 1 needs to be made unpredictable. Of course, I'd hate it to be too predictable - but the idea of trying to force unpredictability is something with which I still struggle to come to terms. I wrote about the issue of tyre wear in the new Pirelli tyres over a year ago, and explained how I didn't feel it was right to try and "plan" the so-called "excitement" of high tyre-degradation. I love to see smaller teams taking the fight to the big boys as much as the next fan, and I'm always keen to see new, young driving talent coming through the field, challenging the old order - but this excitement and competition should be a result of huge driver skill, and inspired engineering vision, not because of dodgy tyres which have been made specifically to be dodgy to give these kinds of results. When I saw Jake Humphrey and Eddie Jordan ask "is F1 becoming too unpredictable?" at the beginning of the BBC's coverage of yesterday's Belgian Grand Prix, I surprised myself by answering "yes". Eddie Jordan went on to say he believes racing "can never be too unpredictable", but I disagree. Or rather, I disagree if that unpredictability is for the wrong reasons. So, what are the "wrong" reasons? Well, the "right" reasons would be lots of closely-matched, highly competitive racing drivers, fighting wheel-to-wheel to win races. 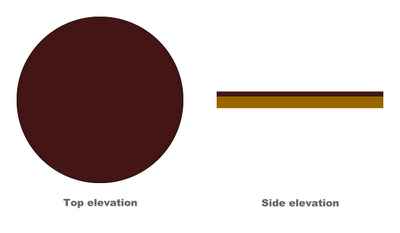 But, as I've mentioned, tyre wear is now a big factor - in my opinion, too big a factor. So are recent developments like KERS and DRS. However, I don't believe it is right when these other factors have a bigger influence on race results than the skills and commitment of drivers, team engineers and mechanics. When a top driver wins one race, and then finishes outside the points in the next race - and similar things are happening to other top-level drivers - that can't be good; it's consistency which wins races, and by forcing this type of inconsistency on the racers you take the results out of the remit of driver skill, and leave the races down to the luck of whose equipment will fare best on the day. We often praise the design of modern-day F1 cars for their hugely improved reliability (many fans will, I am sure, still remember the days when it was not uncommon for engines to blow up, gearboxes to fail, and so on, during races, and several retirements a race due to mechanical issues was not an abnormal sight) but that praise can seem slightly hollow, when the regulations practically institutionalise unreliability, in the form of tyre wear, etc. Just my opinions, of course - but I worry that we may get a stage (if we haven't already!) where we are not allowing the true skill of these drivers (the best drivers in the world!) to shine through, because we insist on giving them sub-standard equipment, in order to "make races more exciting". Instead of looking at the results from today's Belgian Grand Prix, and talking through what happened, I am going to write about a more peripheral, but more personal, issue instead. I have been saddened, and more than a little hurt, by some of the recent comments about the performance of the Williams F1 team. In the BBC's preamble to today's show, Eddie Jordan claimed that "the reemergence of Williams into the winners' circle capped it all" - a remark which stung a little, for someone who is, and has always been, a big fan of Rubens Barrichello. Barrichello was dropped by Williams at the end of last season - their worst ever, in terms of points scored. I believed at the time, and I still do, that this was a very poor decision. I hoped (perhaps churlishly) that Williams' results would not see a significant improvement in 2012, as I feared that their decision to axe Barrichello would appear vindicated by such dramatic reversal of fortunes. The team's results have improved, and they have already scored over ten times the amount of points they amassed over the whole of 2011. I firmly believe, however, that this is down to improved car design, and not down to the drivers they have this year - the breathtakingly unremarkable Bruno Senna, and the utterly bewildering Pastor Maldonado. Whilst I've nothing against Bruno Senna, it seems clear to me that the team's decision to replace Barrichello with him was not a good one; he's not a bad driver, but his results so far (16, 6, 7, 22, DNF, 10, 17, 10, 9, 17, 7, 12 - accruing a total of 24 points so far this season) are nothing to write home about especially. I believe that the hugely experienced Barrichello could've achieved much more with this vastly improved Williams car. Pastor Maldonado, however, clearly has a screw loose. He has finished in the points only twice this season, of which one was his much-talked-about victory at the Spanish Grand Prix (the other was an 8th place, giving a total of 29 points so far this year) but aside from this one (fluky) 1st-place finish, Maldonado has done very little to show that he deserved to keep his place at Williams after last year's debacle. Apart from his shock win, Maldonado has been making the headlines for all the wrong reasons. From his overly-aggressive tactics in Monaco to this weekend's crash with Timo Glock, the number of times he has been called to Stewards' inquiries must be some kind of record (could someone check that for me?) and I know I'm not the only one who has called into question some of his driving over the past few months. His racing style is a particularly volatile combination of arrogance and clumsiness - David Coulthard has pointed out occasions of Maldonado "using his car as a weapon" - and he appears to have very little respect either for the rules of the sport, or for its other participants. Last year, Williams scored an astonishingly meagre 4 points across a whole season. Of these 4 points, Maldonado contributed 1 (that's 25%) with Barrichello scoring the other 3 (75%). 3 points is an awful total for the year, and a driver of Barrichello's calibre should've done better - but it's still three times what Maldonado managed! If Williams wanted to bring Bruno Senna in to have someone different in the team, that's perfectly understandable - but for me, he should've replaced Maldonado. As a huge fan of Barrichello, you could say I'm a little biased, but I have a feeling that this post will resonate with other F1 fans, who may not necessarily be as fond of Barrichello as I am. I don't see Williams' 2012 season as the stunning ascent to their former glory that some people seem so keen say that it is. They are currently 8th in the Constructors' Championship (last-but-one of the teams to have scored points this year) and their inconsistent drivers bring in dribs and drabs of points here and there, when they're not too busy retiring from races, or taking other drivers out in the closing stages of races - but is that really enough? If Williams really want to become one of the "big teams" again, they need a driver who can consistently deliver podiums, and points finishes. Of course, I can't guarantee that Barrichello would be that driver - but he'd certainly have had a better chance than the mediocre Senna, or the headcase Maldonado, and I am still quite upset that the team never saw fit to give him that chance.